You will love the look and feel of these Adidas Essence Core Jammers! They come with the fashionable 3 stripe design which will make you look stylish and unique at the pool! These Adidas swim jammers offers the perfect blend of comfort and durability making them perfect for your training, fitness and leisure swimming sessions. This Adidas Swim Jammer is part of the 2017 Swimwear range, Adidas swimsuits are well loved by swimmers because of their excellent lifespan, fantastic comfort fit and bright colourful designs with fashionable cut styles. This makes the Adidas Swimwear range perfect for training, fitness and leisure use! The men's black and white Adidas Essence Core jammers are a great choice for swimmers looking for a new pair of jammers for swim training or fitness swimming. The Adidas Essence Core jammers are made with Infinitex® which is designed to offer you comfort & a perfect fit every time, the Infinitex® technology offers greater durability, shape retention & defence against fibre breaks that usually occur in chlorinated water. These Adidas jammers are part of the Adidas 2017 range of swimwear. Adidas Swimwear is loved by swimmers because of their long lasting nature, excellent comfort and stylish designs. 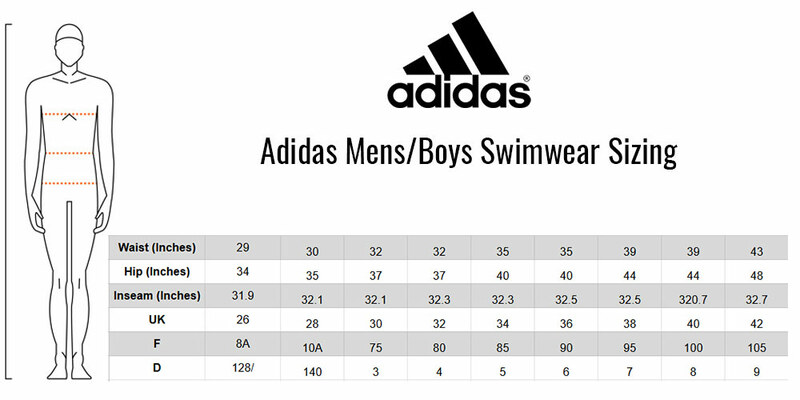 The quality of Adidas Swimwear is exceptional and is reflected by its popularity among swimming elite and rapidly growing global presence. Get yours today to find out why everyone is talking about Adidas! Adidas men's Essence Core Jammers from the new Adidas 2017 swimwear collection. Features the Iconic Adidas 3 Stripe print on the sides. Easy to adjust drawstring gives a secure and comfortable fit with full freedom of movement for all swimming strokes. Durable Infinitex Drive Fabric allows this swim short to last for 100s of hours making it perfect for regular swim training. Chlorine resistant fabric prevents fading and increases shape retention, allowing your swimming shorts to look like new for longer. The material feels dry and soft to the touch even when wet.